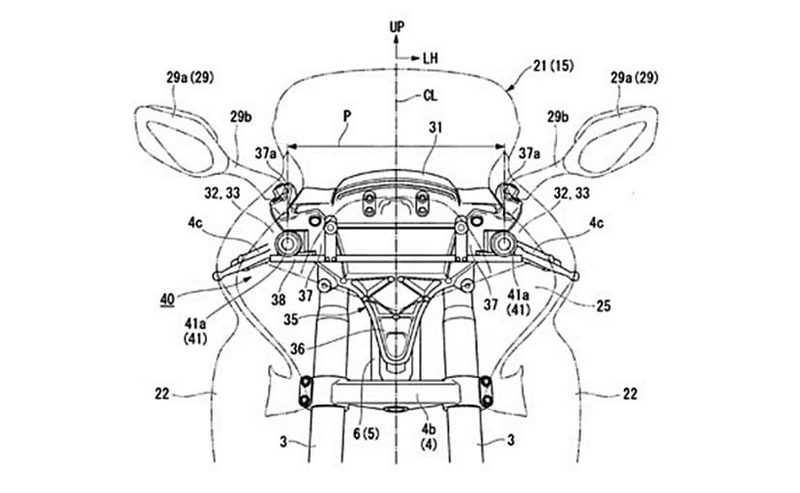 Patent images filed by Honda show the flagship touring bike equipped with a pair of cameras in the front fairing, as part of a new safety system. Honda has filed new patents for a future Gold Wing which reveal that the flagship luxury touring motorcycle from the Japanese brand may come equipped with a pair of cameras in the front fairing. The work of the dual cameras is expected to trigger the automatic safety system in case it senses a collision. The system uses the pair of cameras to produce a stereoscopic image upon which the bike's electronic safety system can react and make safety-based decisions, like automatic braking and limiting speed. Adaptive driving assistance systems, or ADAS, are the next level of electronic safety systems which are used in cars. These systems avoid collisions with a vehicle or pedestrian, running out of a lane on a highway, recognising road signs or reacting to the driver falling asleep on the wheel. Now, it looks like such safety systems will be available in the next generation of big bikes as well. KTM and BMW Motorrad are already working on similar safety systems using front and rear radars, which are currently under testing. How the Honda Gold Wing system is different is that it uses a set of two cameras instead of radar, and will trigger the bike's electronics safety system if it senses a collision. Honda already uses a similar system, called Honda Sensing, which looks at lane position, adaptive cruise control, cross traffic/blind spot monitoring and speed limiting tech on the latest generation Honda Civic and CR-V cars available in international markets. The new safety technology for motorcycles is expected to be unveiled at one of the big motorcycle shows later this year, maybe with a debut at the Tokyo Motor Show first.